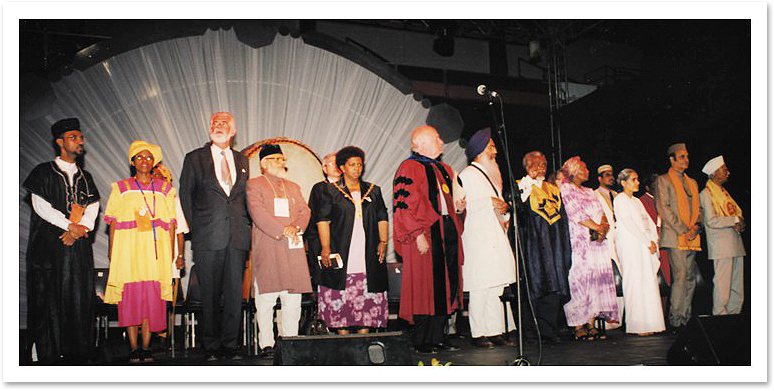 The Parliament of the World's Religions was held from December 1-8, 1999 in Cape Town, South Africa. Cape Town is nestled against Table Mountain, overlooking the Atlantic and Indian Oceans, and is home to many races, religious traditions, and cultures. At the Parliament sponsored by the South African government, teachers, scholars, religious and spiritual leaders, believers and practitioners from around the world gathered to share their insights and wisdom, to celebrate their diverse backgrounds, and to address the vital moral, spiritual and religious issues presently facing the global community. In the city, one could not walk two blocks without seeing a poster of Master, which gave the area a feeling of being warmly embraced by Her blessings and love. The opening of the Parliament on the first of December coincided with World AIDs Day. An hour of speeches by religious leaders on that day included pleas to the governments of the world to work more diligently on behalf of AIDS victims, and for the people of the global community to come together in prayer and support for the victims. The ceremony ended in a silent prayer. After the opening speeches, fellow practitioners, wearing beautiful traditional attire, and under blue banners bearing the name of The Supreme Master Ching Hai International Association and joined in the opening day Parliament procession. We greatly outnumbered the other groups in attendance and thus naturally were the most "eye-catching" team. South Africans were astonished that our group came from all the different continents of the world to enthusiastically support this event. Some of us were holding invitation pamphlets for Master's speech that were to be distributed on the following day. Master's beautiful picture was on the cover, and people drew near requesting copies. As the procession passed a small red car, we caught sight of Master awaiting Her turn to speak at the Parliament's next ceremony. She was dressed in classic Aulacese fashion in bright gold with a traditional-style royal hat of the same color. As the parade neared the site of the ceremony, the ringing of church bells announced the start of this magnificent event. The event was held outside on a flat hilltop in Cape Town's historic District Six which became famous in the mid 1960's as a sad and terrifying setting for Apartheid (racial separatism) in South Africa. This governmental policy, begun in 1948, made it illegal for Blacks to live in or even visit the major cities of South Africa without a special pass issued by the government. All of the Black city residents were moved to distant townships, usually resulting in a splitting up of entire families. Blacks were also stripped of their property and position and many were left destitute. In the case of District Six, the area was zoned for destruction under the Group Areas Act in 1966 and its residents displaced. Although this terrible policy has changed since Nelson Mandela was released from prison in 1993 (he became president of South Africa in 1994), many of the scars remain among Black South Africans, and their moving speeches reminded us that we are all part of one universal family. This ceremony was important in many ways. For all of those present, one could feel a healing on a grand scale taking place. The entire event was wrapped in dignity and symbolism, and we felt honored to represent the great love and blessings that our Master gives to the world. The District Six Ceremony took place on a large circular stage at the foot of majestic Table Mountain. It began with a light bearer carrying a great torch. Microphones had been set up at the four corners of the stage, representing the gates of the four directions of the world - North, South, East, and West. Legend has it that each of the four directions is guarded by each of the four races of humankind, (white, black, yellow and red) and each one is a guardian of a different element, (fire, earth, wind, and water). In the center was a larger torch that was to burn throughout the week-long Parliament of the World's Religions. Representatives of each race stood in their appropriate places and spoke to their own guardianship on behalf of their people. A touching element of this ceremony was that all of the elders of the races were women accompanied by small girls. This was not only highly symbolic of the transition to a more tolerant, loving and forgiving age (represented by grandmothers passing on their wisdom to girls), but it also closely paralleled several speeches that Master had made during the Cape Town retreat about how more peaceful ages were always represented by matriarchal societies (those ruled by women) and that we should return again to those roots in order to move into the Golden Age. Since Master Herself is such an outstanding female spiritual leader that transcends many religious norms, Her presence at this symbolic event represented an important milestone in our spiritual and cultural history. Thank you, brothers and sisters, for taking the time to come here to pray for Africa. Together we will also pray for the world. May I ask you a few seconds of silence to reconfirm our wish to the Lord. Thank you so much. I have been praying to God even before I came here, for your land, and for the world, as always. I have told Hirm, Father, You know every thing; You grant our wish before we even ask. Whatever You arrange for us is the best for our spiritual development. It doesn't matter how bleak it looks at this moment, Your will is Supreme. Your will is always the wisest, the best, and the most compassionate in the end. Pray let us know this; pray let us never forget that Your will is always the most loving in the highest sense of universal Truth. We thank You also for giving us the occasion to be here today in this beautiful city, one of the most beautiful places on this planet, and to see all these beautiful, pure, simple-hearted people. It is our honor of many lifetimes to have such an occasion, because we are here by Your will. We live here by Your will, and we shall go back to Yourself by Your will. But we don't have much chance to see each other physically. Although this physical world is a grand illusion, all Your creation, it is still very beautiful to us; it is our home. And in this sense, we also dedicate to You today, if You wish, that the people of this land, or any land, have the home that they wish and a peaceful life with all the dignity as God's children, as You shall will it. We dedicate to You our heart, our love, and our utmost surrender that whatever You shall arrange for us, it will be Your will. Nevertheless, since we are in this physical condition, we must endure many illusionary hardships, which hinder our spirit and separate us from You; therefore, pray Lord, grant us some of the dignity of basic peacefulness so that we may have enough calm, enough surrender, to remember You every second of our lives. You are glory; You are beauty; You are richness; You are the most fantastic vision of Perfection that we could ever remember. Let this Perfection also be manifest on this planet. Perhaps, in some of the lands of the planet that need more blessings than others, we will be willing to be work together to help some of these less fortunate lands, some of the less fortunate corners of the world, such as this little corner of Your creation. Blessed be You, my Lord, that You remember us in this corner of Africa. Perhaps all Your children deserve Your love and blessings, but maybe this corner deserves a little bit extra. That shall be our prayer for today. Next, Master addressed the problem of the displacement of refugees and other unwanted groups by stating, "It is through Your will that we wish people around the world will have the homes that they wish. Our physical condition separates us from You. Grant us the dignity and peace to remember You all our lives. Let Your perfection be manifested on this planet." With Her hands reverently folded in prayer, Her words were deeply moving. After a powerful retreat, all the initiates present shared Her vision of a more positive tomorrow and Her wish that through this gathering, the world would come closer together in peace. Some of us thought that it was a strange coincidence to have chosen not only South Africa, but especially Cape Town as the site for our retreat and the Parliament of the World's Religions. 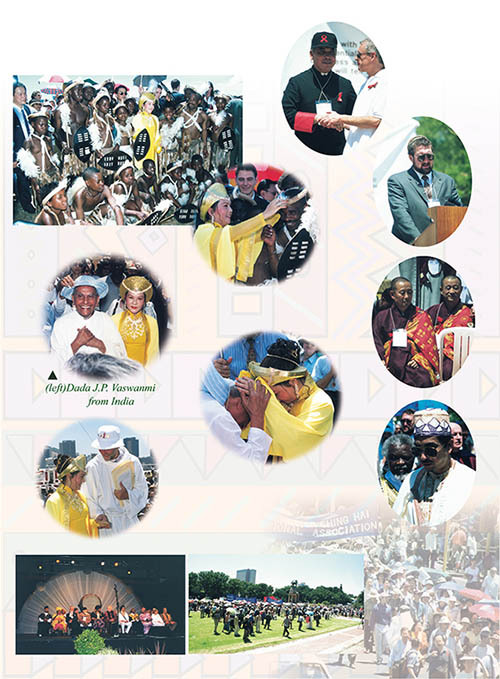 Master, representing the Ocean of Love, had brought people from all races and corners of the globe to the southern tip of the African continent, a unique place in all the world, where the Indian and Atlantic oceans join to become one. Ninety percent of the world's countries are touched by these two oceans, and it is on this spot that they converge. 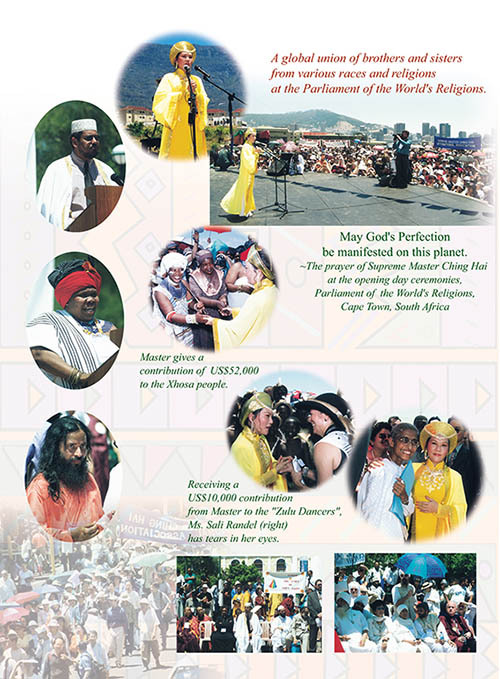 In addition, the Parliament in South Africa had brought the most prominent spiritual leaders of our time to this place to share in a new age. Today, the boundaries between different countries, races, cultures, and sexes are disintegrating. 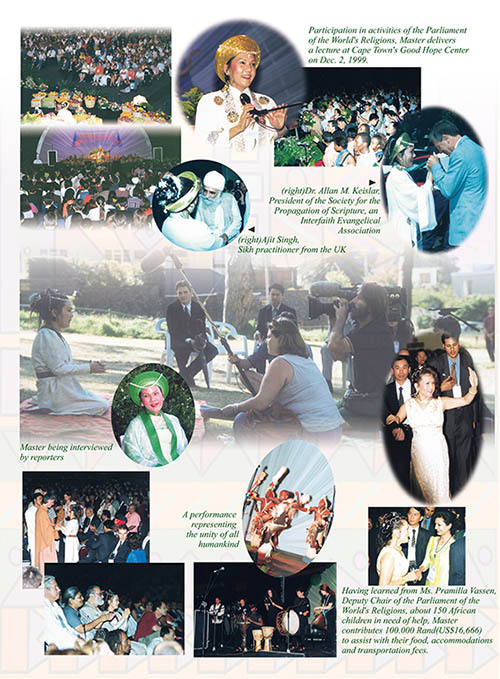 Human beings are making important decisions to become re-united with their harmonious God nature so as to march into the next millennium hand-in-hand. On December 2nd, Master delivered a 45-minute lecture at Cape Town's Good Hope Center, where the stage was decorated with fresh flowers, fruit and green plants. The banner in the center of the stage read, "Heaven Is Only the Beginning - See God While Living." We sensed a highly elevated atmosphere permeating the Center as we gazed at this uplifting message. To the sound of music and the applause of the audience, Master entered the hall in traditional white and yellow Aulacese attire. After the master of ceremonies briefly introduced the Quan Yin Method, Master began by saying, "God dwells within us. Every scripture has told us the same message. If God is within us, it is simple to get Hirm out. Since ancient times we have forgotten the message of the great Masters - God is within you, you are God, and you can see yourself. We should not call each other humans, but a replica, the essence, a part of God, an individualized God, the Supreme Master. Since ancient times, whoever has called himself this has been ridiculed. We are the children of God. We came from God and since we came from God, our surname should be God. Call yourself that Name. [Applause] I'm so happy you've accepted your identity without ever seeing the Father!" Master then assured the audience that She could help them find their way home to the Kingdom of God, stating that periodically God has sent certain messengers to remind us of our true nature. "We forget the noble persons that we are, so God sends people like Jesus, Buddha, Prophet Mohammed, Guru Nanak, etc. to remind us of who we are. Even the greatest angels have to serve us, but we pray to them as if they are greater. As soon as we understand who we are, they will serve us." Next, Master discussed the heavenly realms: "After initiation we will go to a higher or lower part of Heaven. When we attain a higher degree of enlightenment, we will see all the greatest beings lining up to help us. The most incredible experience people describe is sexual ecstasy, but this pales in comparison to the bliss of Heaven. When you are in ecstasy, sometimes God appears as a Father or Mother. When your soul radiates light, you are the light. The more condensed version of light becomes the sound. Physical music is close to the music of Heaven. When we hear this music, we are so energized by the Word of God or the music of Heaven that people change completely and immediately. The more they meditate, the younger they become, the more innocent, purer, and closer to Heaven." Master then remarked, "True baptism with the fire of the Holy Spirit takes less than a second. Nothing separates us from God except our attention. I'm just showing you how to change your attention to a different dimension. We can see God while living." After these words, Master concluded: "I'll show you how to do this. We can go within, not without. Within, we will see the reality of all creation, the God who is not physical and has no name but has been called many loving names --'Loved One,' 'My Dearest,' 'The Eternal Beloved,' 'The Faithful,' etc. It would be best for us to be reunited with this Loved One again. The soul wants solid experience, face-to-face contact with God, and with that I can help you. God blesses you so much!" Due to time limitations, Master talked only briefly, leaving time for questions from the audience. In response to a query about the way to recognize a true Master, Master said that a true Master is one who can show you God. Another person asked Her how to deal with the poor and the suffering, and the injustice in the world. Master replied that She shares Her resources, both material and spiritual, with those in need. However, to address these problems more fully, the consciousness of the planet must be raised, and this She cannot do alone. She invited everyone to join Her in this effort. After the lecture, many of the audience members were initiated into the Quan Yin Method or learned the Convenient Method. The initiation process was held in a nearby church in District Six. Master came personally to bless all the new initiates, and as they left the church after initiation, their smiling faces glowed with happiness. That evening on the green meadow outside the church, Master was spontaneously interviewed by many groups of news reporters. Some of our fellow practitioners, including new initiates, joined the interview session. Master answered various spiritual questions raised by the reporters, Her humorous and wise words often drawing applause and laughter. A Muslim brother initiate shared his experience while practicing the Quan Yin Method, saying: "I believe in Allah. There is only one God, but with different names. I used to pray five times a day, and my belief was strong, but I kept asking myself: 'Where is God? Why am I here?' After I was initiated, I saw Mohammed, Jesus and Buddha. They were happy for everyone and for the world. When I meditate, I die and I am in contact with my true Self. I have gained great understanding through my meditation." One reporter, who showed great interest in Master and our group, raised a concern about his own wisdom eye. After being told by Master that his wisdom eye was open to a certain degree, he wanted to know why he was different from the initiates in our group. Master told him that the difference was that we knew how to use our wisdom eye while he did not. Master then taught him how to use his wisdom eye to have a glimpse of God. After the interview, Master, our fellow practitioners and a few guests sat on the green meadow enjoying the setting sun and cool, gentle breeze. A newly initiated brother, a law student from central Africa, told Master that other fellow practitioners he had met during the retreat had helped him with his financial problems. Hearing this, Master immediately gave him US$10,000 to cover his tuition expenses until graduation. We were all touched by Master's demonstration of unconditional love. At 9:30 PM that evening, initiates returned to the Good Hope Center for a dance performance by various local dance groups. Master had met the members of one group, the "Zulu Children Dancers" on the previous day, December 1, When Ms. Sali Randel, the group leader, mentioned that they needed funds to help some of their dancers, Master immediately contributed US$10,000 to the group (see Appendix A). Unable to believe her good fortune of receiving more than double the amount requested, Ms. Randel, with tears in her eyes, held the money up for everyone to see. She invited Master to take photos with them, and Master promised to watch their scheduled performance at the Good Hope Center the next day. As the performance began, many children filled the stage, each representing children from different corners of the world, and holding a cup of water. They then poured the water into a big pot, symbolizing the unity of all children, and presented it as a gift to the Parliament of the World's Religions. Next, the children sang, "We Are the World." The last performance was a traditional African drum dance, for which the lovely children were dressed in traditional African costumes. Their enthusiastic and talented dancing earned a huge round of applause from the audience. On December 1, in addition to the US$10,000 assistance given to the "Zulu Children Dancers," Master also rendered a contribution of US$52,000 for the Xhosa people to rebuild single family houses and enhance the toilet and water systems in their community (Appendix B). A very touching story lies behind this event. The founder and Director of Icamagu Institute, Ms. Nokuzola Mndende, was asked for help by an extremely poor Xhosa community. Although she had tried her best to respond, she had very little money. Her only recourse was to pray sincerely to God to help these unfortunate people. In response to her prayer, Ms. Nokuzola said that Master had come like the wind and dropped the money into her hand. Ms. Nokuzola commented that she was unable to adequately express her gratitude, while the Xhosa people, as they have since time immemorial, expressed their happiness and gratitude to God by their beautiful songs and graceful dances. On December 2, following the performances, Master learned that some children were in need of help, and immediately She contributed an additional 100,000 Rand as requested. (US$16,666) to the Council of the Parliament of the World's Religions to help 150 African children obtain food, accommodations and transportation back to Durban, South Africa (See Appendix C). Master also gave instructions to send another US$20,100 to the "Kids Haven" of Johannesburg (Appendix D) when informed by a local fellow practitioner that this orphanage needed aid. Appendix A: A letter of appreciation from Ms. Sali Randel of the Zulu Dancers for Master's US$10,000 contribution, expressing that she will name a fund benefiting people in need for Master Ching Hai. Appendix B: A letter of appreciation from Ms. Nokuzola Mndende, founder and director of the Icamagu Institute, for Master's US$52,000 contribution to the Xhosa people in South Africa. Appendix C: Receipt from Rev. Dirk Ficca, Executive Director of the Council for the Parliament of the World's Religions, acknowledging Master's 100,000 Rand (US$16,666) contribution to the next generation of Durban, South Africa. Appendix D: Receipt from Kids Haven, Johannesburg, South Africa for Master's US$20,100 contribution.